Favorite Beer: It changes, just like the seasons, but it’s currently the Secession CDA from Hopworks. By far the tastiest Black IPA / CDA I’ve ever had. Favorite Beer Haunt: Locally I tend to enjoy the seemingly endless selection of sours available over at the Cascade Barrel House. A lot of PDX’ers may not realize just how unique and special that place is for the development of bold, tart beer. There really isn’t another place on the planet (that I know of) that even compares with the quality AND quantity that they produce. For lack of a better word, I think it’s “dreamy”. What was the first craft brew you ever tried? What did you think? Like a lot of folks, Fat Tire and NBB initially helped me realize that beer could actually have flavor. It was a gateway for me to try new craft beers on a regular basis. But it wasn’t until I had a Unibroue’s infamous “La Fin Du Monde” years later that I realized how much of an impact Belgian and Strong-ales would have on me. At the time I couldn’t believe a beer could be 9% ABV, but now I tend think of it as an “easy drinking strong ale”. Haha. Needless to say, Belgian-style beers are tops for me. So much, in fact, that I now work each summer in Belgium! Do you homebrew? If yes, favorite homebrew to date: Yes. Rather new to it, just partial mashes thus far. My latest creation, a 8% Honey Orange French Saison, came out fairly decent. I’ve been experimenting by blending champagne into the beer for a little extra “sparkle”. I’m considering brewing a Belgian Tripel next with Sweet Potatoes. How’d you hear about the pdxbeergeeks? I saw you guys wearing the T-Shirts at the Holiday Ale festival and looked you up on Twitter. Love the name! What does being a beer geek mean to you? Spending countless hours researching beers online, attending beer festivals, becoming giddy over extremely nerdy things like vertical tastings, and getting to say fancy words like “brettanomyces”. It’s also our obligation to convert “normal beer drinkers” over to our side. This can be a fun exercise. (Happy to report that my father can no longer stand the taste of Corona, go Dad!) Being a Beer Geek is also a great excuse to travel. I tend to line up each vacation around visiting breweries and seeking out the best local beer bars. If you could change one thing about beer culture in the US, what would it be? When it comes to US beer, we are leading the WORLD in beer styles and in experimentation. So NOTHING needs to be changed there. But I think the whole attitude about beer consumption needs to change. I would love to see moderation be encouraged. We should focus on creating a richer experience around enjoying a single beer. We could do this in lots of ways like by serving each beer in a custom glass, at the correct temperature, and perhaps more of a focus on bottles rather than drafts at the bar. I also think we should lower the drinking age to 16 or 18 like they have in Europe. Start young, but start safe. What do you love about Portland’s Craft Beer scene? How the number of breweries increases dramatically ever year but there is still plenty of room for more. Rather than a high supply creating ugly competition, it creates positive exposure, drives up the quality, and allows for more niche styles. When a neighborhood gets a new brewery it’s almost like it’s instantly transformed into a cool area to hangout. People from all over the world know about our town, and we’ve created quite the beer vacation destination as a result. 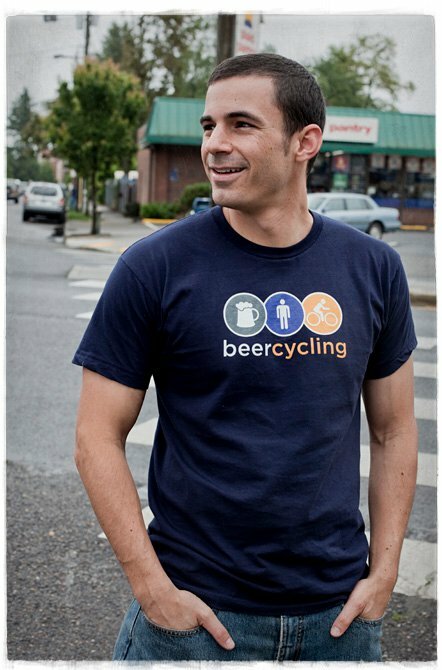 What can you tell us about Beercycling? In 2011 I started an outdoor adventure company around my passion for beer and bicycle touring called “Beercycling”. We currently offer guided 10-day beer tasting cycling tours in Belgium, the Netherlands, and next year in San Diego. Every day of the tour we get some great exercise, visit a new brewery, and get to learn all about beer right from the source! We take care of the bike rentals, hotels, routes, language translation, and most meals, all for one flat rate. So you get to just show up and ride as we guide you from Pint A to Pint B! We currently have 5 tours in 2012 open for registration on our website, www.beercycling.com. If you are thinking about making your pilgrimage to Belgium, and want to do it in a unique way, we might have just the tour you’re looking for!